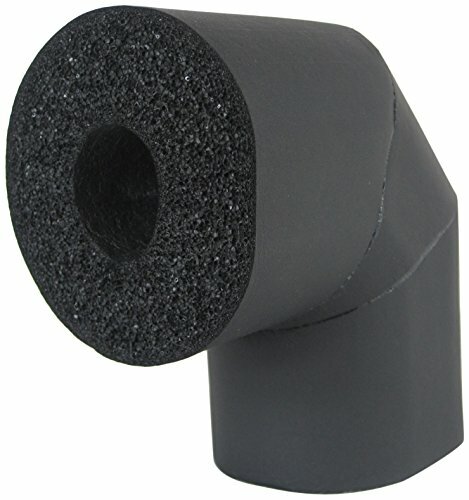 K-Flex K-Fit prefabricated fittings are the easiest, most reliable way to insulate pipe fittings. They are produced under controlled conditions in our manufacturing location using an automated process to ensure uniformity, good fit and watertight seams. For pipes greater than 4-inches IPS, fittings are butterfly design. For pipes 4-inches IPS and below, fittings are mitered. Fittings are non-porous, fiber-free, CFC free, and resist mold growth. They are used to retard heat gain and prevent condensation or frost formation on refrigerant lines, cold water plumbing, and chilled water systems. They also retard heat loss for hot water plumbing, liquid heating, dual temperature piping and solar systems. They are made from a UV-resistant elastomeric blend. For moderate UV exposure, no additional protection is needed. For severe UV exposure (rooftop applications) or for optimum performance. The closed-cell structure and unique formulation of fittings effectively retards the flow of moisture vapor, and is considered a low transmittance vapor retarder. For most indoor applications, fittings need no additional protection. Additional vapor barrier protection may be necessary for fittings when installed on low temperature surfaces that are exposed to continuous high humidity. They have a flame spread rating of 25 or less and a smoke development rating of 50 or less as tested according to ASTM E 84, "surface burning characteristics of building materials". They are acceptable for use in duct/plenum applications meeting the requirements of NFPA 90A/B. They are provided only for use in the selection of products to meet limits specified when compared to a known standard. ASTM C 534 type 1 (tubing), type 1 / grade 3 (ECO), ASTM D 1056-00-2B1, New York City MEA 186-86-M Vol. IV, USDA compliant, RoHS compliant, UL 94-5V flammability classification, ASTM E 84 25/50-tested according to UL 723 and NFPA 255, Complies with requirements of CAN/ULC S102-M88. If you have any questions about this product by K-Flex, contact us by completing and submitting the form below. If you are looking for a specif part number, please include it with your message.